I'm about to roll out some new pieces of jewelry to my shop, so I needed some new photos... of course, I have to use my two favorite subjects. 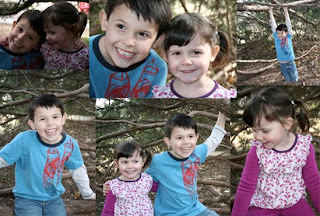 So, we headed to the park for a little Sunday afternoon photo shoot. Um, yeah, we need to work on that fake smile. What about you? How was your weekend? Hehehe, what cute little models you have working for you! Our weekend consisted of chocolate, banana smoothees and a walk through the park. A lovely weekend! CUTE! I love the fake smiles... where do those come from? Can't wait to see your new jewelry pieces! How lovely! Thanks for sharing with us these pretty photos! Can't think of better subjects than those cuties! I hade a great weekend...cooking dinner for friend on saturday and on sunday the Up in the Air the new george clooney's movie! Look at how happy those cute little people are! Can't wait to see what all you've been working on. Me and the O man hung out while the other half was at Adv Princ. It was a nice low key weekend for us.